Buy a few copies of Climate Change, by HRH Prince Charles, Tony Juniper and Emily Shuckburgh, Ladybird Expert Book £7.99, and give them to your friends. Carbon dioxide levels in our atmosphere and associated surface temperatures have been rising since the start of the industrial revolution, when coal started to be used to drive engines and fuel industrial processes. Our planet is suspended in space, far from any other planet. Apart from the odd meteorite, nothing arrives on earth and nothing leaves. There is no “away”, where we can dump anything we don’t want. The fossil fuels we burn, add to carbon dioxide that has already been discharged to our atmosphere since industrialisation began. The CO2 in the atmosphere acts like glass in a greenhouse. It prevents an increasing proportion of the sun’s rays that hit the earth from being reflected back into space. 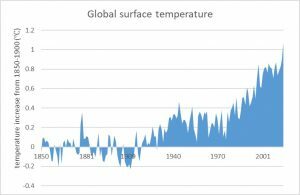 Global surface temperatures increase as atmospheric CO2 content increases. 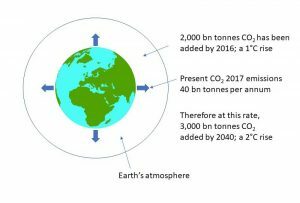 To keep the planet’s temperature to within 1.5°C of pre-industrial temperatures, there is only a finite amount of CO2 that we can put into our atmosphere. Every tonne we emit today reduces the amount our children and grandchildren can put there tomorrow. 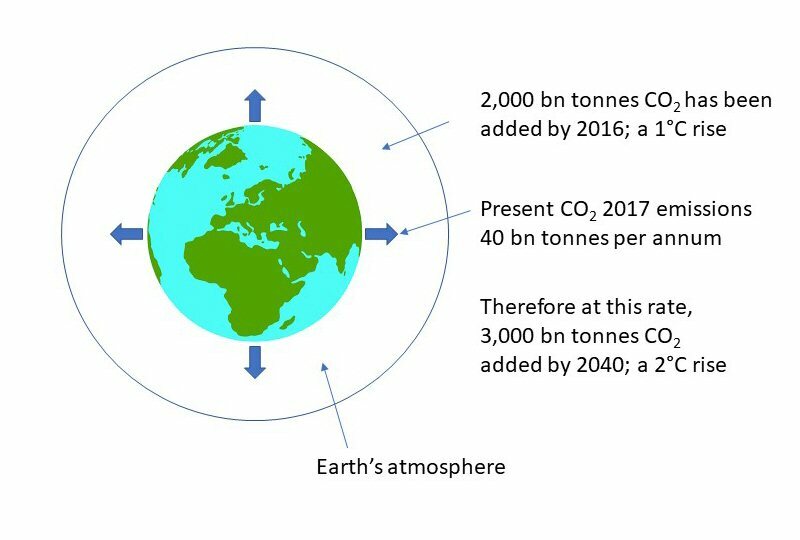 CO2 production in 2016 is approximately 40 billion tonnes per annum (See Figure 2). At this rate the global temperature of the planet will reach 1.5°C above pre-industrial levels in five years. It will reach 2.0 °C above pre-industrial levels in 25 years. Only by reducing our annual global emissions below this rate can these timescales be extended. By the time we have reached 1.5 or 2.0 °C above pre-industrial levels, we will have used up our allowance and must stop putting any more CO2 into the atmosphere. As the level of CO2 rises, a new equilibrium will develop between the sea, soils, land and atmosphere. There will be increased acidification of our oceans, which in turn will impact on marine life. The temperature of the sea and land will rise. The rate of plant and tree growth will increase, which for a time will marginally slow down the increase in CO2 in the atmosphere. A new equilibrium between ocean, land and atmosphere will establish, but we do not know its full consequences. The burning of fossil fuels to produce energy is the major cause of carbon dioxide emissions. Once the sink in the atmosphere is full, we must stop using them. We will have large reserves of un-burnable carbon in oil wells around the world. These will become virtually worthless. To keep under the 2°C increase, we must 1) reduce the energy we use and 2) change from carbon fuels to energy from wind, solar, tidal, biomass, with nuclear used only if it is both price competitive and essential. The Paris Climate Accord (December 2015) is a great step forward. It has marshalled almost all the countries in the world to agree a common approach, starting in 2020. While this is a significant first, it is basically an agreement to limit CO2 emissions by member countries so that global temperatures do not go 2 °C above pre-industrial levels. Yet no maximum emission figures have yet been set for the various countries, and no sanctions other than naming and shaming have been agreed. The recent withdrawal of the USA is a big blow. This is likely to be short lived however as many US cities and states have said they will ignore President Trump’s stance. Whether these CO2 emission reductions can be made without resorting to energy rationing is yet to be seen. The alternative is for every one of us to develop a culture of minimising our carbon fuel use. This is where environmental activists should concentrate their efforts. We must take personal actions to reduce our own carbon footprints and pressurise government to commit to firm five-year targets, not sit on their hands while endlessly talking.